Learning Thai massage involve giving and receiving during practice throughout the entire course. Student's physical readiness is necessary. It is not advice for a person with conditions contraindication to receiving massage in general such as heart condition, high blood pressure, problem with blood vessel, among other conditions including pregnancy to attend Thai massage courses. Should you have questions if you have certain condition and can attend the course or not, please write to us prior to enrollment. We will discuss and find best solution together with you. They are the heart of Thai massage and most useful to people from all walk of life and around the world. Take even one class—any of these short courses—and you can bring home to your family a valuable gift that last a life time. 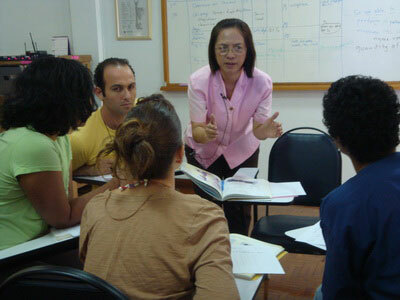 The course are successful because we provide detail demonstration teaching technique, closed attention during practice, details text book and manual, suitable learning environment— all help our students to learn and absorb each level of learning in the time efficiency, thus cost effective to students with proven outcome. An Earth Bag by special children. Herbal tea, practice clothes, transportation in pickup zone. 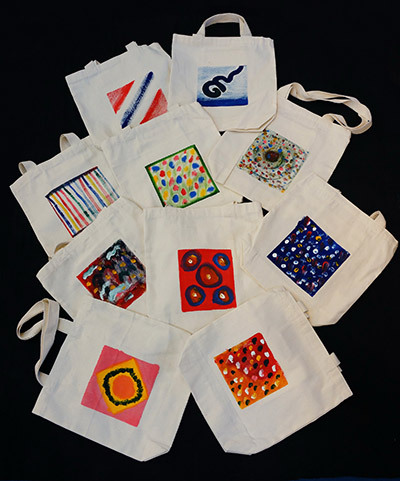 Earth Bag hand painted by Special Children is for you on the first day at TMC. 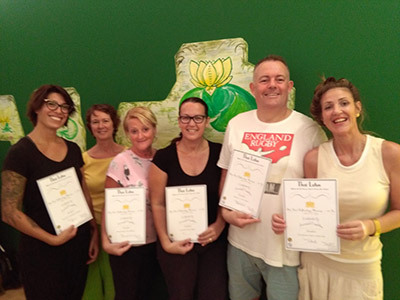 Level 1 Foundation of Thai Massage builds a strong foundation for students the knowledge of ancient Thai massage positions cover the entire body-total 160 positions plus a full day of 2 hour full body massage training. In general, it takes 2-3 weeks in normal learning to cover all positions; however it is possible at TMC, with the teaching system of clear demonstrations. Teacher gives clear- details explanation, how to find the line, sitting and hand positions. Students have TMC textbooks in hands to refer to stretching effect and caution. TMC curriculum, Foundation of Thai Massage level 1 covers whole body massage positions of head, neck, shoulder, facial, back on side lying, back massage face down, arm, abdominal, leg, stretching and closing of session. Students practice in pair after demonstration with teacher's closed supervision. According to TMC systematic teaching process, students can learn and absorb all 160 positions—a full body massage session in 5 day learning. Students also learn general knowledge on Thai massage regarding safe practice, cautionary area and contraindication to massage. 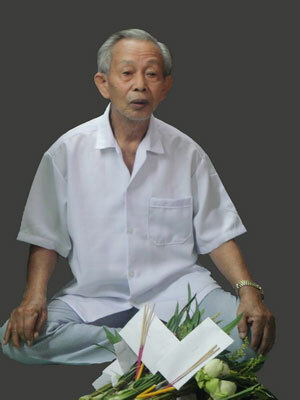 The complete explanations are in the given textbook "Ancient Thai Massage Healing with Prana": Fourth Edition". This Level 1 class is an amazing teaching system, enabling the coverage 5 day content! I did not believe at first, but along the course, I did not feel tension but confident and fun instead. Teacher demonstrations twice and being by my side for correction and support at all the time make this claim possible." I only have 1 week to study. 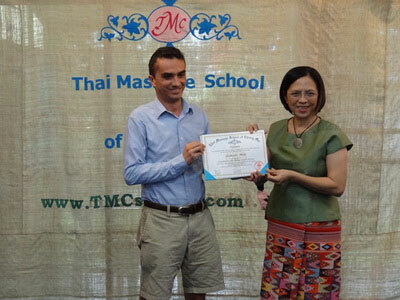 Level 1 – Foundation of Thai Massage at TMC gives me complete knowledge of Thai massage to go on. I am able to continue practice on my own from the wonderful text book given at the class. This really save me time and money." Yogi Exercise, Hand-Knee exercise, meditation. Introduction: Hand and sitting position in Thai Massage. Lesson 5: Back massage on side lying position demonstration / practice. Review Lesson 1,2,3 / spot check to improve technique lesson 1,2,3. 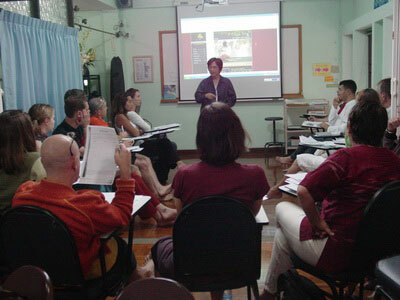 Lecture on General Knowledge of Thai Massage. Lesson 6: Back massage face down position demonstration. Practice Lesson 6: Back massage face down position. Lesson 7: Arm massage demonstration / practice. Continue Lesson 7: Arm massage / practice. Review Lesson 6 and Lesson 7. Pressure check with teacher for effective massage. Lesson 8: Abdominal massage demonstration / practice. Lesson 9: Leg massage demonstration /practice. Continue Lesson 9: Leg massage demonstration / practice. Review Lesson 9 leg massage / spot check and pressure check. Lesson 10: Body stretching demonstration/ practice. Lesson 11: Conclusion demonstration /practice. Demonstration of Whole Body Massage. Practice according to students’ need to cover any lessons. (Lesson 4) and back side lying (Lesson 5) and switch. 2: Massages (Lesson 6) 5 techniques and switch. 1: Massage technique 6 back facedown (Lesson 6) and switch. 3: Massages body stretching (Lesson 10) and closing (Lesson 11) and switch. Practical test is a part of an on-going evaluation by the teacher during practical training of each lesson, correction are made along the training to assist student until able to perform each position adequately. A short quiz is given during the week. Completion of Level I course. Note: Class schedule time-table may be adjusted according to the students' level of understanding. However, all lessons will be completed within the course time. Complete 17 postures of Yogi Stretching Exercise. Level 2 Thai Massage Enhancement course is the most effective curriculum to re-enforce and improve the foundation learned from Level 1. Under closed supervision and systematic teaching technique worths a month of student self learning! Students will realize how much they can perform the whole routine and how effective they can become. Stretching and 12 variation techniques is added to this course. Students learn massage planning and apply 160 positions from Level 1 and 18 more lessons in Level 2 for 1-2 hour massage. 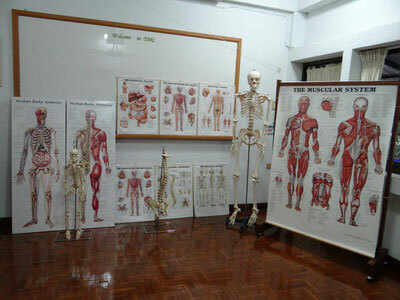 Students will be able to perform 1-2 hour massage from the techniques successfully with suitable planning. Students will gain understanding of safety massage, contraindications, anatomical landmark on the different parts of the body especially on the back while giving massage following the steps in the manual-textbook. The teacher will explain and teach how to locate these anatomy landmark areas. 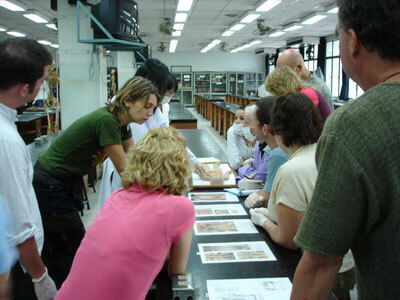 A short presentation – anatomy and physiology is shown in the class for better understanding. Presentation on Sen Sib in depth and tracing Sen Sib with the teacher’s instruction to ensure understanding and ability to massage with knowledge on location of the lines and Sen Sib on the body. Level 2 workbook given in class shows graphic of sequences from Level 1 for easy reminding steps. The workbook includes Yogi Stretching Exercise “Lue Sri Dadton” of 17 postures with ancient drawing. Students will receive full training on the Yogi Exercise started from Level 1 and continue until complete all 17 postures in Level 2. This is a course in itself. Yogi exercise, knee-hand exercise, meditation. Foot cleaning demonstration, preparation to perform massage professionally. Review Level I sequences using card technique. Demonstration review sequences of massage from Head to completion by the teacher. 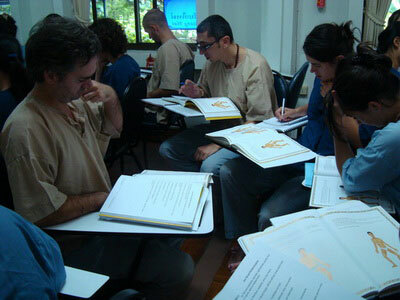 Students practice after each session of review sequences. Supervision and technique correction by the teacher and pressure check. Students practice after each session of review sequences with the help of Cards. Overview of characteristic of a good Thai massage. Demonstration of variation techniques to use of elbow and arm/practice. Practice 1 hour massage with selected massage plan of Level I. Spot check and overview performance at the end of practice session. New Lessons: Demonstration of new positions 18 more lessons/practice. Overview practice integration of applying new positions and Level I positions when giving massage. Workshop on Tracing Sen Sib. and symptoms related to Sen Sib and massage planning discussion. Practice 2 hour massage with integration of Level I and Level II. Spot check and overview performance at the end of practice session and pressure check. assist student until able to perform each position adequately. 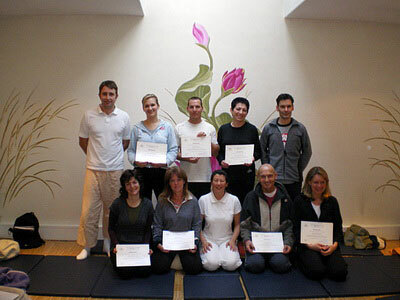 Completion of Level II course. Following is schedule of level 1 and 2 consecutively, or you may like to have a break of a week before taking a higher level which is possible depends on the schedule. Select the date, write it down to further "click to enroll". 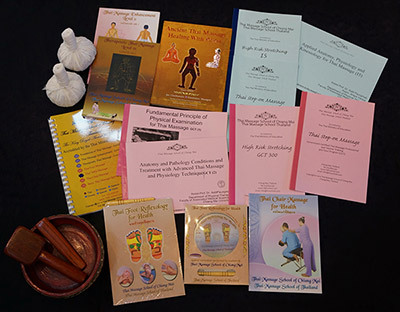 Receive Level 3 detailed workbook 191 pages of 22 healing lessons proven to be effective by the Thai Massage Revival Project including full detail in the making of Herbal Ball and the application to Thai massage healing, additional variation technique manual. Three herbal balls -1 fresh- 2 dried. 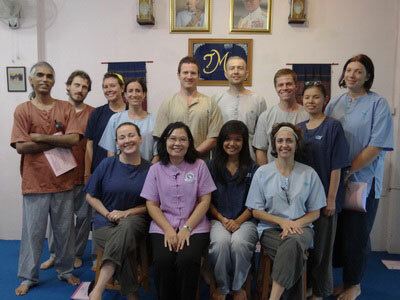 TMC teachers were blessed to become students of the Monk – Chief Advisor of the project and his top disciple is the direct teacher to TMC teachers for all therapeutic techniques taught. 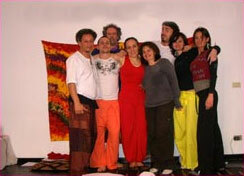 Our direct teacher is one of the 12 teachers in the Thai Massage Revival Project. Level 3-22 lessons cover how to solve different ailments such as lower back pain, strain, sprain, headache, constipation, leg cramps etc. Teacher demonstrates and points out each pressure point (acupressure points) and how to apply with therapeutic purposes. Therapeutic massage is applied together with the massage techniques learned from Level 1 and 2. The class includes massage planning to apply to different ailment and practice to provide therapeutic massage under closed teacher’s supervision. 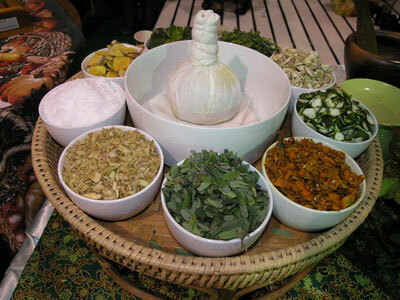 The fun and interesting part of this course is the last day- Friday, where students get to learn how to make fresh herbal ball from fresh herbs, herbs’ properties and how to prepare them. Then the end is to make them into beautiful ball. 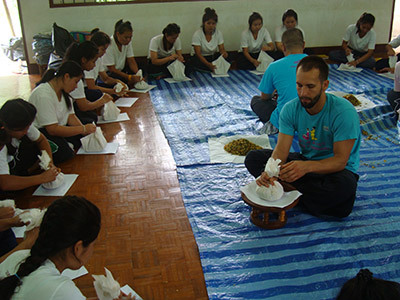 Students will learn how to apply steamed herbal ball with Thai massage for therapeutic result based on techniques learned from L 1-2- and 3. This workshop prepare students to be able to adapt how to make when they return home. 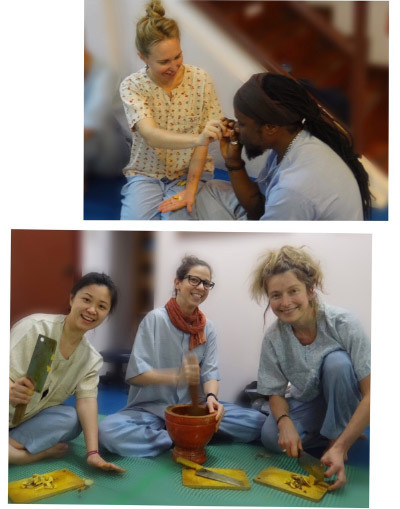 This healing application is the most common in all Thai massage places — in the temples and community hospital bases. 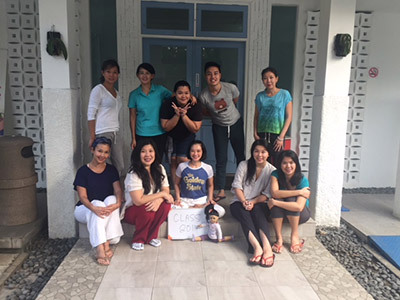 TMC’s Comprehensive Thai Massage 90 Hour Program enables Thai students to earn approval to work as professional massage therapists in Thailand by the Thai Ministry of Public Health. Introduction to Therapeutic Thai massage. Lesson 9 Headache and neck pain / practice. Lesson 8 Self massage for headache and neck pain. Lesson 7 Neck stiffness / practice. Lesson 11 Arm weakness, numbness and stiffness/ practice. Lesson 4 Self massage for hand and arms. Lesson 5 Shoulder blade stiffness / practice. Lesson 1 Knee pain / practice. Lesson 2 Self massage for knee. Lesson 12 Indigestion and abdominal gas pain/ practice. Lesson 10 Prevention of menstruation cramps/ practice. Lesson 14 Self massage for Leg pain. Lesson 3 Sprained ankle / practice. - Massage Internship with student on solving situation of Headache and Neck pain with 45 Min. Lesson 19 The making of herbal ball from fresh herbs. 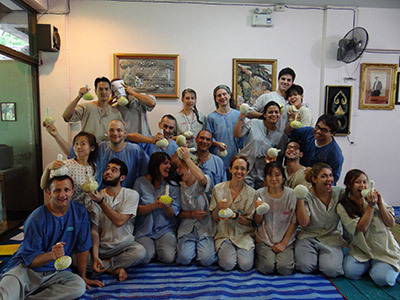 Lesson 20 The application of herbal ball in Therapeutic in Thai Massage. Completion of Level III course. To manage school effectively, we need to set course date schedule. If you plan to attend Level 1 – 2 and 3 or even just -may be-, you should select the date that you can continue to Level 2 and 3 when you start the class on Level 1. Level 1 class starts every Monday, but for students plan to take higher level need to select class start from these dates. Please select the date and write that down you need it when you enroll for the course. This is the most effective short term course in Thai massage. Students will learn all 3 levels to be able to perform effective Thai massage for 1-2-3 hours including therapeutic Thai massage. This is the course for student with available 3 weeks time otherwise student may take each level and return for higher level in the future. Read details of the course from each Level above: Level 1, 2 and 3. 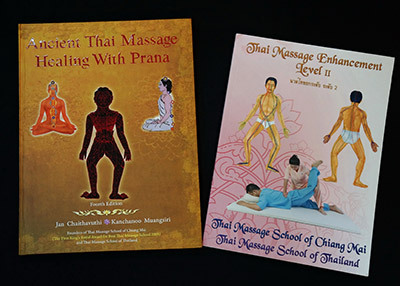 Receive text book “Ancient Thai Massage Healing with Life Force: Third Edition” value 1,150 Baht. Level 1; additional 19 lessons manual; 12 variation techniques manual. 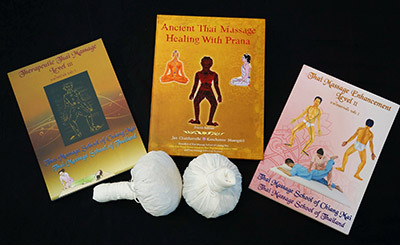 Level 3 detailed workbook 191 pages of 22 healing lessons proven to be effective by the Thai Massage Revival Project including full detail in the making of Herbal Ball and the application to Thai massage healing, additional variation technique manual. Receive 10% discount when apply for all 3 Levels at the same time. Discount is given at the school on the first day. "Returning Student" system is very helpful for students who want to pursue their dreams either to become practitioner or a Thai massage teacher. It is difficult for anyone to leave work and home for a long period of time. The system enables students to take classes according to their availabilities arranged in segment of time in advance. TMC posts 1 year schedule. Returning to join week 6 of 10 week program. Example: student who wants to do 10 week program can spare the course to 3 periods, first period is 1-3, second period is 4-5 and the third one is 6-10. Student can come for a review prior to class begin with the normal going on class -- 1 day without extra charge. Third Edition" value 1,150 Baht. 7,500 Baht: If change to 5 days course pay 2,000 Baht more. Basic Thai Massage is for learners who have limited time but wish to acquire basic knowledge, minimal stretching techniques and less practice time than the 5-day course. 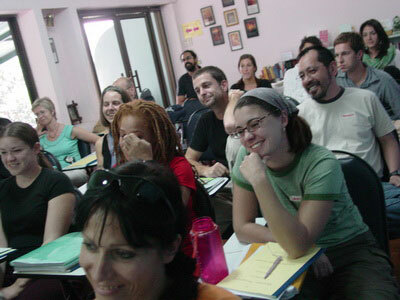 Students participate in the first three days of the 5-day course. 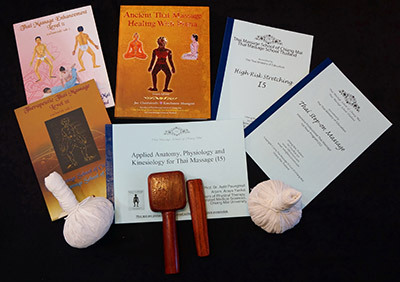 The course includes the text book Ancient Thai Massage Healing with Prana: Fourth Edition. 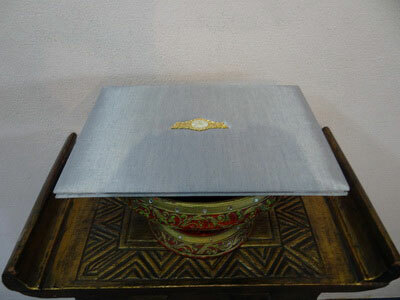 Receive workbook of Thai Table Massage. 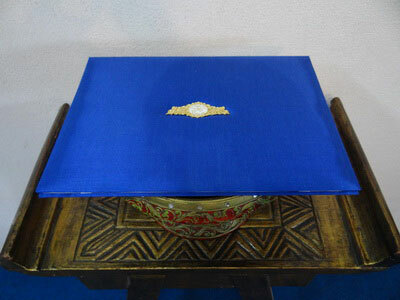 Thai Table Massage is the most practical Thai massage for people who prefer to work with massage table. Great complement to spa to apply Thai massage with other massage modality and herbal ball application. 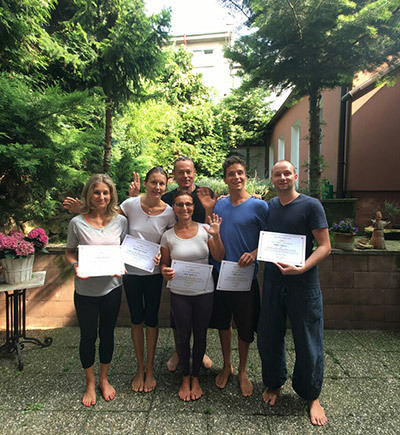 The content of this course is based on Foundation of Thai Massage (Level 1), unique revised positions appropriately and applicable on Table and maintain genuineness of Thai massage formalities. The purpose is to suite the physical demand and work space to some practitioners and applicable to beginners as well. Practice on western style massage table with adjustable height for effective massage and body posture. 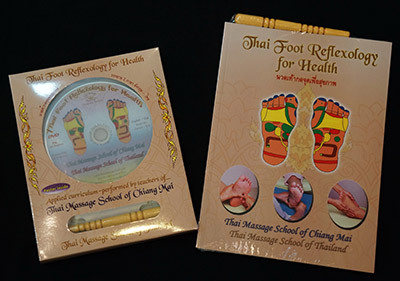 Receive workbook of Thai Foot Reflexology and massage tool. Thai Foot Reflexology is an impressive 2 days class. 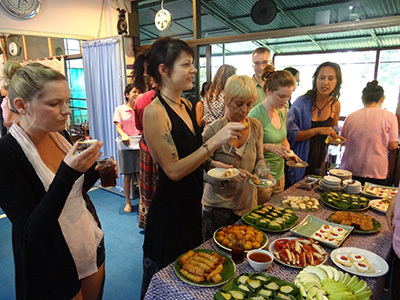 The teaching ensures your ability to perform Thai foot massage to your guest! This is the only course you will be able to go home with a true knowledge in Thai foot massage in 2 days. Fun to learn and can do it for real. TMC effective system of learning Thai foot massage will help you achieve this goal in 2 days. 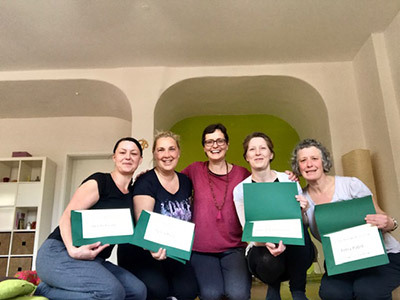 The course is suitable for all learners: It is a lifetime gift to bring home to family and friends, or add on to massage professional career. TMC most effective and systematic training will enable students to follow the teacher’s demonstration easily with provided charts and workbook, then practice the lessons with so much fun and pleasure. Short sessions in legs, hands, arms, and shoulder massage are included in the course. The training is less physical demand than body massage and suitable to most people. Workbook with chart and wooden stick –massage tool- are included. 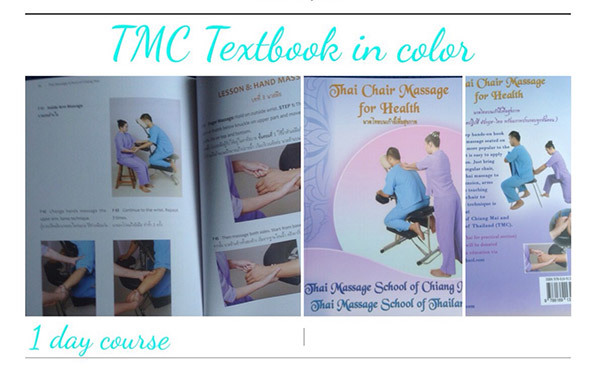 Receive workbook of Thai Chair (Seated) Massage. Thai Chair Massage is suitable for most interested learner with or without experience in Thai Massage. This course will guide student how to perform back massage on a massage chair and on a regular chair position. Massage of shoulder, neck, head, arms and hands are also added. The training enables students to apply Thai Chair Massage for family and friends or an additional modality in massage profession. 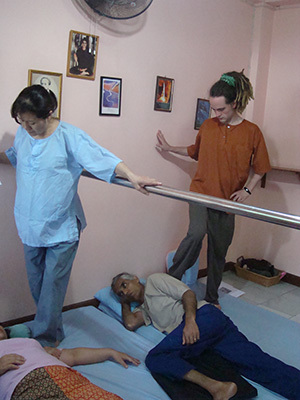 The technique enable student to be able to perform massage in most places with little set up requires. 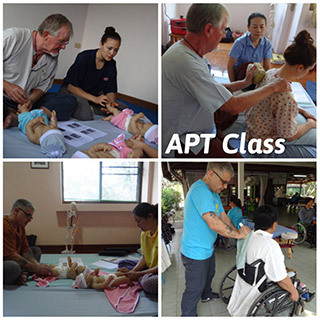 To be able to perform professional Thai massage and related modality with excellent quality and effectively to improve health and wellness for the public; To implement the knowledge and experience important for the graduate to return to continue for GCT Teacher Training Curriculum in the future. Level 2 workbook with systematic sequences of 158 positions learned from Level 1; additional 19 lessons manual; 12 variation techniques manual; complete 17 postures of Yogi Stretching Exercise. 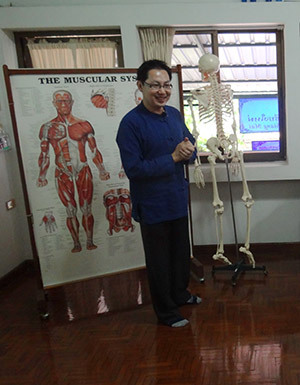 "Applied Anatomy, Physiology and Kinesiology for Thai Massage" By Assistant Professor Dr. Aatit Paungmali or Arjarn Araya Yankai from Department of Physical Therapy, Faculty of Associated Medical Sciences, Chiang Mai University. 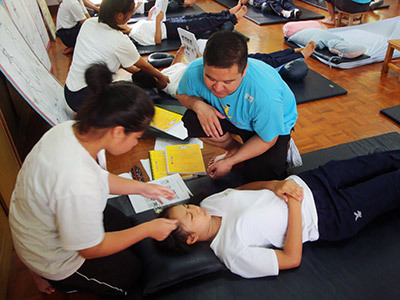 "Theory of Thai Massage" by Arjan Kanchanoo Muangsiri, TMC school Principal/Director. Receive 1 TMC top for field training. CD Memory of Your Time at TMC. Receive 10% discount when apply for all 5 Levels at the same time. Discount is given at the school on the first day. 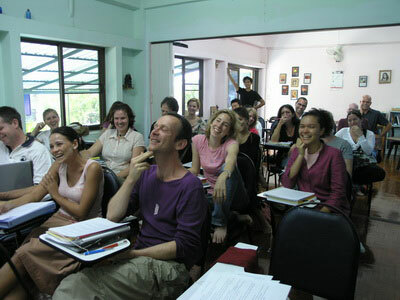 The most comprehensive—intensive curriculum for learners seeking to become professional in the field of Thai massage: The 5 weeks—150 hour training is complete with theory in Thai massage, anatomy, pathology, physiology, kinesiology, bio-body mechanism, contraindications and understanding of quality Thai massage and able to perform with confident and poise. TMC made available reference books in anatomy-pathology and related references to massage for students to review and check out for home study. This curriculum is the first half of the GCT Teacher Training Curriculum of 300 hour and 600 hour. Thus it is the crucial curriculum of all. 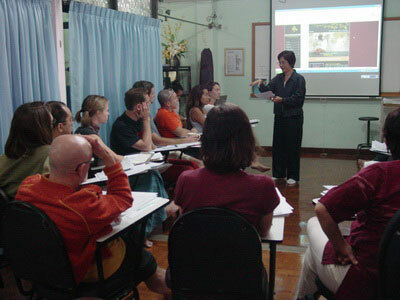 The curriculum is suitable for learners who want to practice in massage field as Thai massage therapist. The curriculum is ideal for learners who seek more in their education to return to continue for GCT curriculum later on. They can find out what they want more in life—if teaching the art of Thai massage is their passion, they can return to complete their dream. 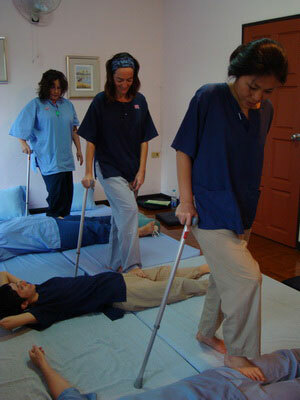 Thai Step-On Massage using a cane is a part of i5 learning. This unique modality - TMC teachers learned from the temple- is to help ease the burden on thumbs and hand and increase more pressure for therapeutic result. I5 is a fun class while it is intense – that is what most students tell us at their last week!The students learn intensively on Level 1-2 and 3. Though they are the same courses in the short courses, but the teachers will expect more from the i5 students. They will be in the class for i5 and GCT (a few occasions there may be 1 or 2 students from the short program join in due to class arrangement) and the teachers will be more strict and more discipline in learning and practicing from them. However, there are times to enjoy and relax – yes when you receive! Students get to go on field training to visit and perform massage for elderly people at the senior center who long to your visit. Then the most heartfelt massage is giving to special children at the children center. You take from them more than giving that is the life experience of giving. 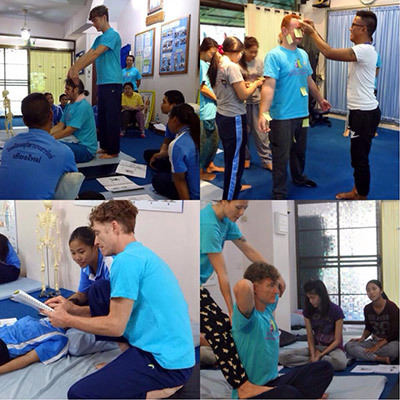 "Applied Anatomy, Physiology and Kinesiology for Thai Massage" to evaluate the recipient’s condition and to ensure safety. This class is taught by Asst. Professor Aatit Pongmali, Ph.D. or Arjan Araya Yankai professors from Department of Physical Therapy, Faculty of Associated Medical Sciences, Chiang Mai University. 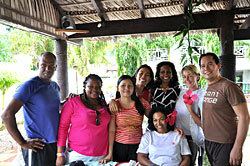 The graduates of i5 will be proudand confident of their knowledge and ability to perform massage professionally. 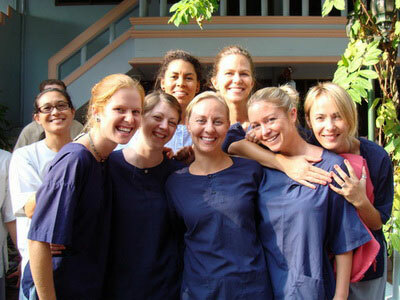 They will be valuable member of massage and healthcare field. 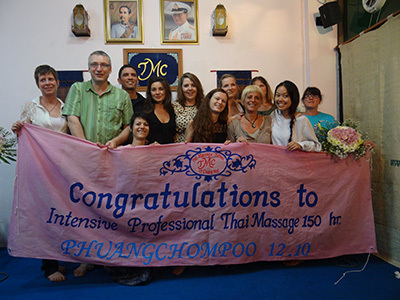 The i5 program will enable students to perform Thai massage safely and effectively. Thus the graduates will be able to offer Thai massage service to the public. 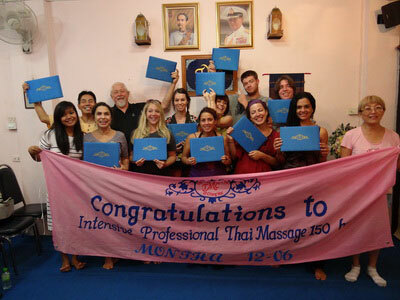 The curriculum is approved by the Thai Ministry of Education for Intensive Professional Thai Massage 150 hour program. For a Thai citizen this program will qualify the graduate to apply for skill testing with the Labor Department for the certificate of Thai massage therapist and able to apply to work aboard. 4 days Thai Massage training combine all knowledge from Level 1-2-3 and additional training on Thai Massage variation techniques, healing massage, massage for senior and special children, and massage planning, review massage with teacher. 1 day Thai Massage for senior persons at the senior center. 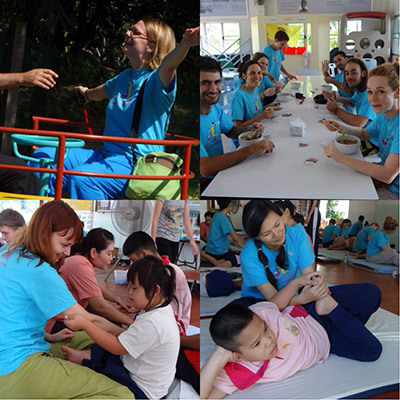 1 day Thai massage for special children at the children center. 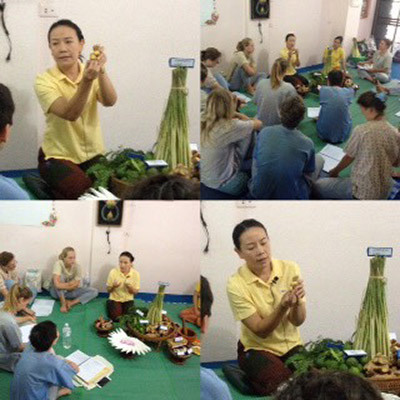 1 day Thai Traditional Medicine local wisdom massage modality of Tok Sen at TMC. Returning student system is very helpful for students to complete their dream to become professional and/or teacher in Thai Massage. It is difficult for anyone to leave work and home for a long period of time. The system enables students to take classes according to their available time and personal affair. Then to return at the future date and able to fit right back and continue the higher level class with the learning system that TMC operate. For example student can take 1 week class at a time or longer until reach 3 weeks and then must follow some rules to obtain professional level such as must take week 4 and 5 together to complete intensive 150 hour program. Student can return to take 5 more weeks for GCT teacher training program. Then still can return to take GCT 600 hour phase II program for 10 more weeks or can take 5 weeks at a time. TMC arrange for students to return a few days to join regular on-going class for review prior to attend higher level i.e. i5, GCT without extra charge. 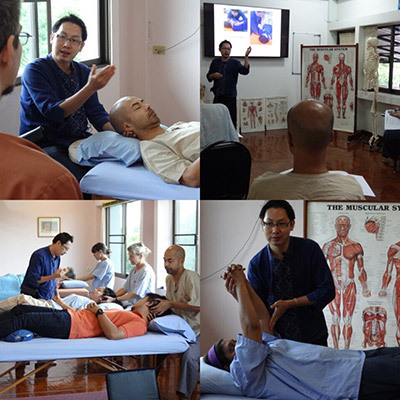 "Applied Anatomy, Physiology and Kinesiology for Thai Massage"
"Theory of Thai Massage" by Arjan Kanchanoo Muangsiri, TMC school Principal/Director. Activity; role play massage session steps. -Herbal tea, practice clothes, transportation in pickup zone. TMC is aware that you may wish to share the moment of your study and activity while learning at TMC and during field training with people in the community. The school will take photos for you in some moments during your various activities except graduation and will upload them to you via Google Drive after your graduation. Students are not allowed to bring any form of camera in the classroom or during field training. This is to avoid distraction of your learning and others also to protect other’s right that we do not have and unable to control from each student camera. So, leave the taking photos to us and BRING CAMERA DURING YOUR GRADUATION! Students completed Level 1-2-3 and wish to return to continue Level 4 and 5 to complete i5 curriculum need to select the schedule below. Review – Evaluation forms are given to students at the end of each class. Intensive 150 Curriculum (I5) and Teacher Training Curriculum (GCT) are given above the weekly evaluation form and also exit evaluation at the end of the curriculum. This is to ensure the effectiveness of the training and the efficiency of school management and operation. We take the voice and opinions of our students seriously and thankfully. Only the one that care will take time to write and tell others what they think either admirations or criticisms. The evaluation forms indicate 6 areas comprise of: Course Manual; Teacher’s knowledge; Instruction; Environment; and Hospitality with the marks from need Improvement, Satisfactory, Good, and Excellent. According to the evaluation we received from the beginning to the present time: We can humbly state that TMC pass 100% Satisfaction mark in all categories from all students. Among them, students give TMC performance in all 6 categories with 92 percent excellent performance, 6% of good performance and 2% offer suggestion to improvement in some areas. Some suggestions are more toward personal wishes and some are very useful for the classes and the school. We take these suggestions into consideration seriously and thankfully and implement and improve those that practical and applicable. Beside the evaluation format, students offer the review and testimonials for school with much love and appreciation of the teachers, the staff and the school. We share some that written to us with you in the Testimonials section. There are still countless words and hugs when students graduates and shower us – especially the teachers - with their loves and appreciations that are not included here. To prove the truth of these words one must be there to experience it. At TMC each class is offer as promise. In teaching and learning there is a bond between the school and the students. We develop stronger bond through goodwill and trust. Honesty is the sacred rule for everyone to follow. Thus the outcome is joy in teaching and joy in learning. If you are searching for Thai massage therapists in your area, you may be able to find one near you from this list. Due to privacy and confidentiality, these names are partial list of the graduates of Thai massage professional therapists that we are able to obtain their permission to post their contact information here. We have 1,500 graduates from around the world. This list is just started, so, it may take some time to have more names of the professional therapists available to you. 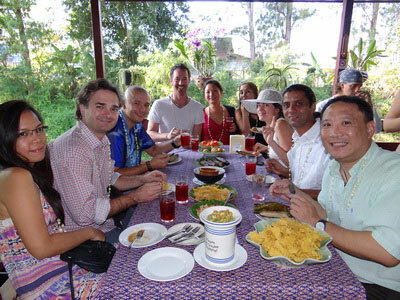 The Thai massage therapists in this roster have completed at least the Intensive Professional Thai Massage Therapist 150 Hour Curriculum as required by the Thai Ministry of Public Health for Thai citizens in order to practice Thai massage to the public in Thailand. Feb. 12, 2016 I’ve taken another important step by absolving the APT - Advance Thai massage Course. I am quite surprised myself about how many possibilities there are to create an individual massage. All my expectations were not only met but even surpassed. 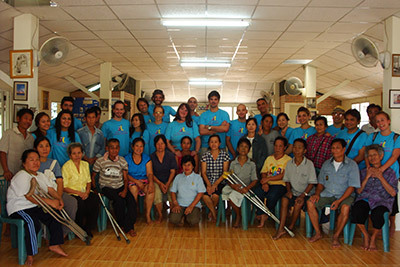 What really impressed me was how all the individual techniques of all different levels could be put to create a unique treatment: level 1 to 3, foot massage, thai table massage, thai chair massage varieties and high risk techniques. Furthermore the treatments of Dr. Artitt and last but not least massage, tok sen and herbal balls could be implemented into the massages. New for me were the massages on expecting mothers and infants. If used consciously you can pro child’s development greatly. In currently 39 real sequences of 60 or 120 minutes each the course teach you how diverse one a good thai massage. Main focus is the treatment of common bodily complaints and blockages. To provide students with time and opportunity to emphasize on massage therapeutic modalities to actually able to apply with set sequences, techniques and knowledge to implement to solve conditions as massage internship therapy (MIT). There have been over 30 cases MIT of real set conditions implemented during 10 weeks study at TMC. These MIT will be study and train intensively and under closed supervision during APT course to ensure students’ ability to master these sequences and techniques and be able to apply them to real life in professional practice. Students will be able to perform preliminary examination to make massage decision safely. Students will be able to perform massage therapy to solve set conditions effectively. Students will be able to offer treatment exercise to receiver to further improve condition. Class time: 2 consecutive weeks – 60 hour program. This program is not part of CE hour to any associations at this time. Time: At the end of each i5 program. The practical test is the part of on-going practice throughout the program. Content may be subject to adjust - change to make the most benefit to learning during the program without prior notice. However any changes will complete the objective outcome for the program. All classes begin with prayer, meditation and exercises. Prior to each case therapy, there will be preliminary examination according to receive set condition massage decision safely. At the end of each therapy session, the therapist will teach treatment to receiver to further improve condition. Afternoon Break is 15 minutes. They are the same courses of GCT 300. Basic Screening before massage, Case #26 Headache and Neck Pain 1 hour, Case #33 Trigger Fingers 1 hour. Teacher is a sacred occupation. To be one is a noble achievement. To train someone to be such a teacher is a life time commitment for the trained teacher represents all the ancient teachers of the art and most of all the representative of the teacher preceptor to transfer the knowledge to others—from one to thousands. TMC has proven to "turn" the sincere students to be equal in ability to teach the same curriculum under GCT curriculum. Teacher is a sacred occupation. To be one, is a noble achievement. To train someone to be such a teacher is a life time commitment for the trained teacher represents all ancient teachers of the art and most of all the representative of the teacher preceptors to transfer knowledge to others—from one to thousands. TMC has proven to "turn" the sincere students to be equal in ability to teach the same curriculum. Fourth Edition" value 790 Baht. 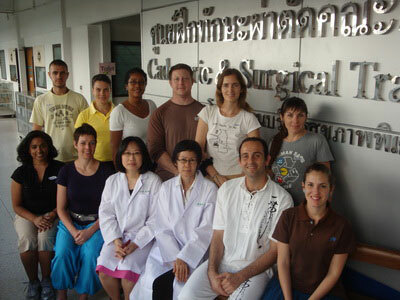 Department of Physical Therapy, Faculty of Associated Medical Sciences, Chiang Mai University. Continue from 5 week study; receive workbooks for Thai Table Massage; Foundation of Thai Massage Applied on Table: Level I Plus. Thai Foot Reflexology with chart and tool. 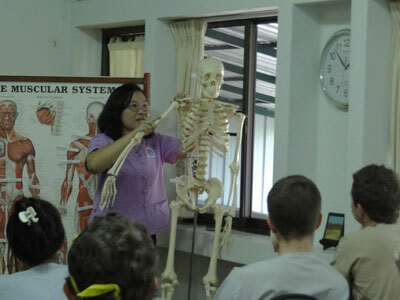 "Anatomy & Pathology Conditions and Treatment with Advanced Thai Massage and Physiology Technique" by Assistant Professor Dr.Aatit Puangmali from Department of Physical Therapy, Faculty of Associated Medical Sciences, Chiang Mai University. Fundamental Principle of Physical Examination for Thai Massage" By Assistant Professor Dr. Aatit Puangmali from Department of Physical Therapy, Faculty of Associated Medical Sciences, Chiang Mai University. "Anatomy and Pathology in Relation to Thai Massage Study on Human Body at Cadaver Lab" at Chiang Mai University Medical Center by Dr. Vipavadee Chaisuksunt, Ph.D. Neurology from Chiang Mai University Faculty of Medicine. "Discussion of massage career and Teaching Business in Thai Massage" by TMC Administrative and Teachers Team. Teaching training on Thai Massage by TMC teachers Team. Receive 10% discount when apply for all 10 weeks at the same time. Discount is given at the school on the first day. Thai Massage School of Chiang Mai and Thai Massage School of Thailand earn trust and acknowledgement from Ministry of Education of Thailand to teach the most comprehensive and prestigious curriculum of Government Certified Thai Massage Professional and Teacher Training International 300 and 600 hour Curriculum (GCT—Government Certified Teacher). 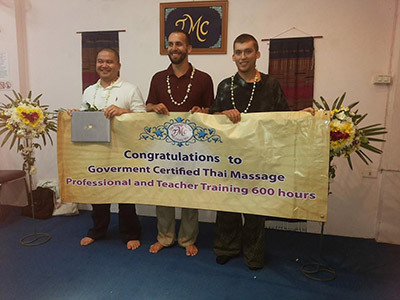 TMC is the sole Thai massage school in Thailand to receive approval from the government to teach professional and teacher training with teaching credential international curriculum of GCT 300 hour and 600 hour program. TMC offers the curriculum with the highest standard in teaching training. 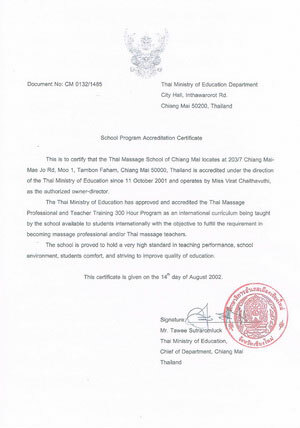 The Chiang Mai Chief of Education Department had issued a certified letter to ensure the authorization of the curriculum and the high standard performance of the school for both curriculums. 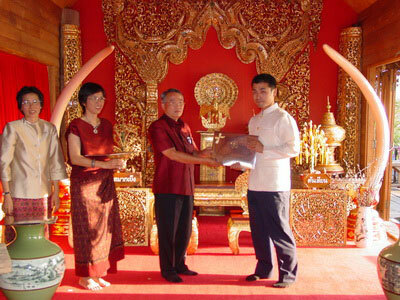 The Graduation Award Government Certified Teacher class: The Chiang Mai Chief of Education Department presided over and granted diploma and teaching credential to graduated teachers at the GCT graduation ceremony in April 2004. Government Certified Teacher students are the most prestigious and honorable learners. 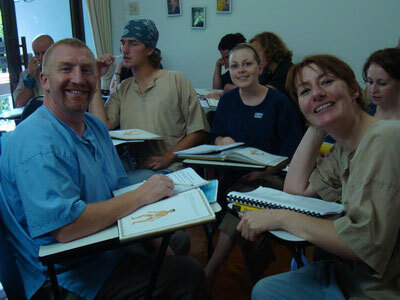 To become a Thai massage teacher, one must possess complete qualifications which includes solid foundation of Thai massage techniques, knowledge in anatomy, pathology, physiology, kinesiology, body movement, contraindications, basic physical examination and evaluation for safe practice, theory in Thai massage and most importantly the education knowledge in teaching. All these knowledge and more are needed for teachers to obtain, retain and continue to grow. In teaching, there is also learning. "Fundamental Principle of Physical Examination for Thai Massage" And "Anatomy & Pathology condition and treatment with Advanced Thai Massage and Physiology Technique." This important course is for massage therapist and teacher to understand and be able to perform physical examination to evaluate the condition of clients in terms of performing safety massage. Dr. Aatit will go in real action of how you can check the client's body, to find out if it is nerve related condition or muscle tension. The professor also teaches stretching exercise to help client and for the therapist to teach the client for self-exercise. Thai Chair massage: as part of the 300 hour teacher training syllabus. Learn how to teach this course and get credential of teaching. 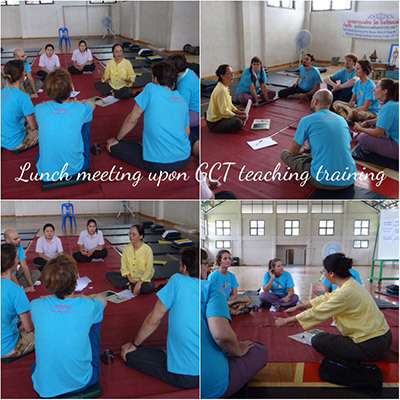 GCT teacher training students are trained under the goal to become Thai massage teachers from day one. They start attend levels of Level 1-2-3 but under more discipline training from the teachers. These 3 courses are the foundation of all Thai massage is about. GCT students are taught to learn each class while observing how TMC teachers demonstrate. Healing Massage Services to Senior and Special Children:Teacher training students attend more formal education training, lecture and workshop in-depth and in boarder understanding than other programs. 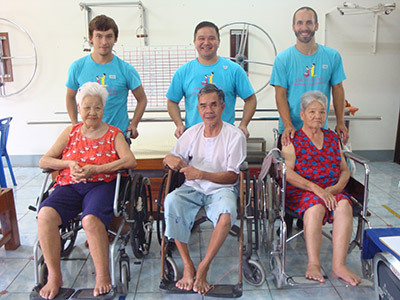 Students perform Thai massage in advance level for community of senior at the senior center and special children at the center. They apply knowledge they learned for the special people under teacher's guidance and supervision. "Anatomy and Pathology in Relation to Thai Massage Study on Human Body at the Cadaver Lab"at Chiang Mai University Medical Center by Dr. Vipavadee Chaisuksunt, Ph.D. Neurology and Assistant Professor Yingpan Anusri from Chiang Mai University Faculty of Medicine. 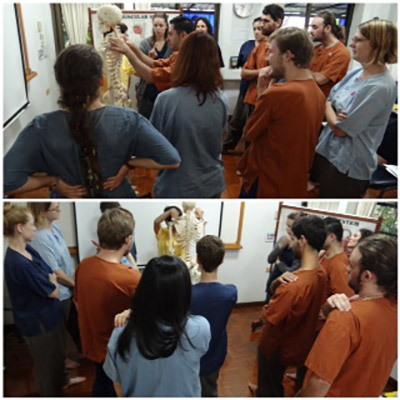 The professors will explain how the muscle and organs function and show the cautionary areas to Thai massage also the contraindication in relation to the human body. You will have a life time experience and some even get to the point of understanding true meaning of life! 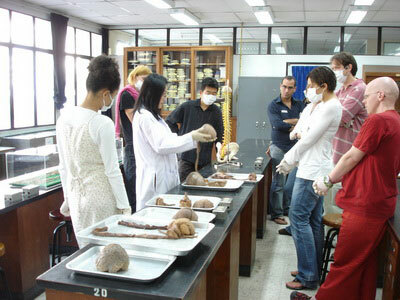 There is a preparation class before going to cadaver lab at Chiang Mai University Medical Center. Certificate of attending provided. to evaluate the recipient's condition and to ensure safety. This class is taught by Asst. Professor Aatit Pongmali, Ph.D. or Arjan Araya Yankai professors from Department of Physical Therapy, Faculty of Associated Medical Sciences, Chiang Mai University. The professor will teach how to identify and locate the part of the body in relation to Thai massage to provide effective result and avoid damage to the body. 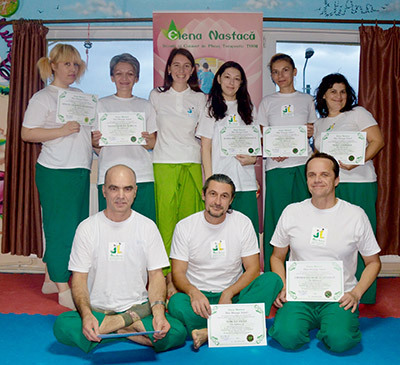 Students will learn about kinesiology and the body movement in Thai massage. This is the must attend class for all massage therapists! Teaching Education and Teaching Preparation:GCT teacher training students undergo formal and effective foundation to become a teacher by learning: Teaching Education; Teaching Planning; Preparation to Teaching; Business talk; Teaching Demonstration; Actual teaching with community students: Method of how to conduct classes in actual setting. 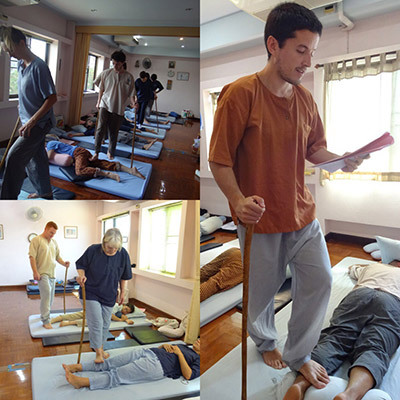 Thai Step-On Massage—The ancient art of healing:GCT will learn modality of Thai Step-On Massage using cane during i5 training. Then further learning to apply with rail to balance the body while using feet to give massage. This is the replica from the temple where TMC teacher trained for the art and received permission from our venerated monk teacher to teach to students. It is the most unique and signature modality of Thai massage since the ancient time that the foreigners are familiar with the quoting from the French Embassador La Lubare "In Siam, when someone fell ill, the person with massage experience would start to help stretch the body by stepping on the receiver…"
High Risk Stretching Positions for more advanced learning:For the level of training, GCT students are capable to perform more strenuous stretching safely. 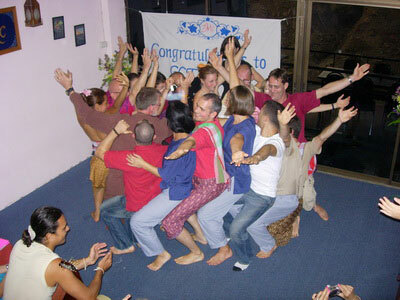 The school offers more stretching positions and differentiate them as "High Risk Positions". The teachers will pay much closed supervision during practice. 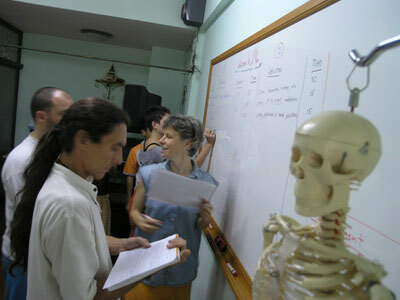 Some positions are integrated in other classes prior to GCT for massage internship training (MIT). Tok Sen is a supplement subject. 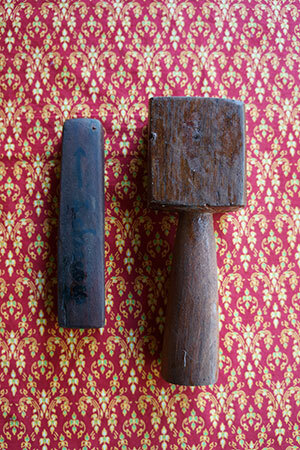 Tok Sen is another ancient healing using wooden hammer pounding along the Sen line on the body. 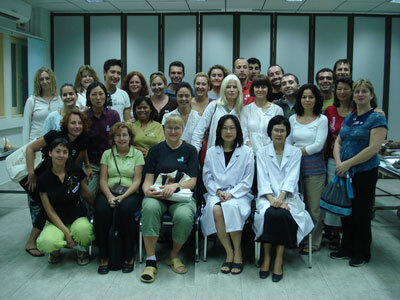 Students will experience the modality and receive training on Tok Sen.
Thai Foot Reflexology course 2 days. 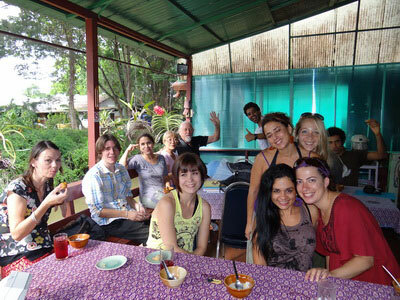 Foundation of Thai Massage course 5 days. The Young Women Development Center (YDC) at Mae Rim, Chiang Mai, The center where girls ages from about 16-20 year old taking vocational 2 year program under YDC administration. The class of approximately 24 girls will get the chance to study Thai massage for career from Foundation of Thai Massage up to professional levels including Thai Foot Reflexology class by GCT teacher training 300 and 600 hour programs and TMC teachers. 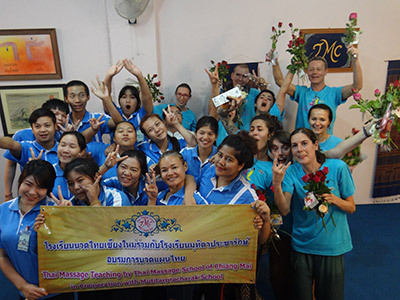 Thai massage teacher training program provides the choice and chances to the girls to find and fulfill their dreams. The Public Health Department is working with TMC school to be liaison between graduates and the quality Thai massage business provider. The girls receive free training and complete with workbooks and practice materials. To GCT teacher, they get to understand what it likes to be a true teacher. The only way to be a true teacher is the competent knowledge, and the actual experience in quality teaching training, plus the teaching credential authorize by the appropriate authority. 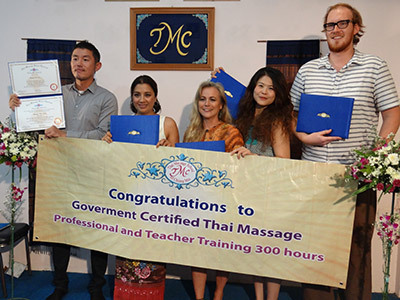 All students graduate from Government Certified Teacher training program at TMC school are the certified teacher authorize to teach Thai massage classes where legal requirement are met. GCT: Government Certified Teachers represent TMC school to the world and can join with TMC school to offer TMC approved courses to anyone under affiliation program. Their students may continue higher learning at TMC school Thailand. Note:To provide education in Thailand, the operator must follow Thai law in establishing his/her own school. The school must provide its diplomas to their students. 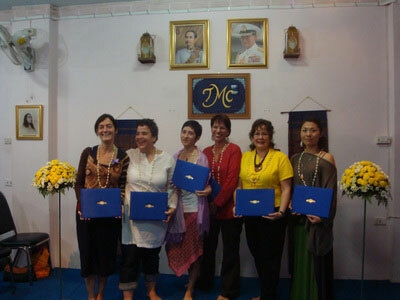 TMC affiliation program does not cover GCT teachers teaching Thai massage in Thailand. Please write to TMC should you have plan to take GCT program in order to provide teaching in Thailand. Content of the program containing the following subjects but may not occur in this order. 8 ½ days Application and integration skill learned with new techniques, massage student guests, additional variation techniques; healing massage; massage for in-house guest and massage planning. Students may enroll for GCT 300 and 600 Phase I and II consecutively with one week break. Phase II any time in the future when course available. Please contact TMC for Visa information. TMC is aware that you may wish to share the moment of your study and activity while learning at TMC and during field training with people in the community. The school will take photos for you in some moments during your various activities except graduation and will put them in a CD and give to you during your graduation. Students are not allowed to bring any form of camera in the classroom or during field training. This is to avoid distraction of your learning and others also to protect other's right that we do not have and unable to control from each student camera. So, leave the taking photos to us and BRING CAMERA DURING YOUR GRADUATION! TMC offer the Post Graduate Review to support the continuing education for our GCT graduates whom we are proud to address as "Thai Massage Teachers Representative of TMC Thailand" — GCT Teachers. Following the GCT program or at the future date, the graduated teachers are able to attend the Post Graduate Review at TMC school for a period of 1 week without charge. To review the class of Level 1 or 2 or 3 to strengthen the knowledge. 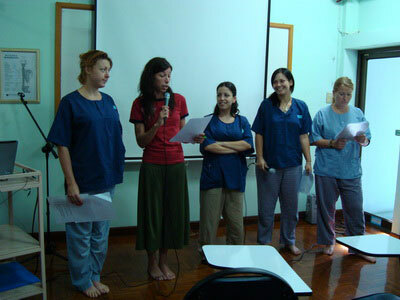 To update the techniques and information as TMC constantly improve the teaching details. 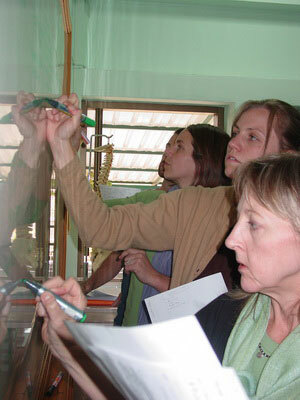 To experience and observe the teaching of the teacher while in classroom training. To improve performance under guidance of the teacher. Post graduation review class is offered as the courtesy to GCT teachers to strengthen knowledge and to update information and there is no tuition fee charged. GCT 600 earns 2 weeks review period and can be taken 1 week at a time. This offer is good one time only—meaning only 1 week – or 2 weeks for GCT 600 no tuition fee charged. If the GCT teacher wishes to attend more than 1 week offer at anytime the fee will be discounted 50% from the full rate of the course and can request for available class. The class offer with complementary transportation, practice clothes, and tea. The text book and manual will not be given but can offer as a loan during training. The school suggest the attendee to purchase the updated manual – if do not have one – for current teaching tool for your own students. GCT teacher may apply for the class right after graduation or in the future date. All attendance must request in advance and receive acceptance from the school. Class schedule is subject to the availability and upon school's arrangement. 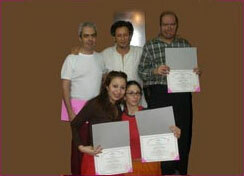 The class will be joining an on–going classes of Level 1, 2, or 3. In some occasions, there are lecture class going on and space available, the GCT teacher may request to attend with no charge—except Cadaver Lab there will be fee. The school will assign GCT teacher to the class requested if space available. Space available means the on-going classroom is within the maximum limit. The school will not be able to open another class to accommodate for this arrangement. The school will assign attendee to the next available class may be not the first choice requested i.e. requested for Level 1, but assigned to Level 2 or 3. The school cannot promise which Level to attend until the first day of class. If the GCT teacher does not wish to attend the class assigned beside what requested, he/she may cancel this request and return to the future date. Once start the class, this offer is fulfilled though the attendee did not complete the class. This is the pilot offer program and we hope to be value learning experience to our graduates. However, TMC reserve the right to cancel the review offer any time in the future without advance notice, except with prior accepted graduates, the school will continue as promised. GCT graduated teachers are the gems of the school and of the world. 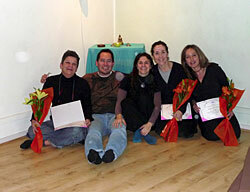 We are proud of these teachers with the love of Thai massage to heal and to spread the knowledge for others. We offer this review without financial gain but as a part of sharing to the world of Thai massage with all the teachers. We hope that this program will go on and benefit all involved. TMC cannot be held accountable for any damage or expenses should the class assigned is canceled due to reasons beyond TMC control. However, TMC will attempt to notify the graduate at the earliest possible or attempt to arrange for suitable learning substitute when possible. Continue from GCT Phase I receive any update on all short courses authorized GCT Phase II to teach. Textbook and workbooks from Level 1-2-3 for updated information and for supporting learning. A box of handmade cards for Level 1 sequences teaching material for teaching for Level 2 teaching. Receive TMC bag and 3 more tops for field training. The GCT 600 hour teacher training program is the most comprehensive and intensive which require strict discipline and determination to reach the goal. The graduate teacher from this one of a kind curriculum is authorized to conduct classes the same with 7 short courses available at TMC school. would require five years of learning and practicing. The possibility to complete the program in 600 hours – 20 weeks is from the well creation and strict discipline TMC applied on itself in following the syllabus. This is the "mother" of all courses there is in Thai massage and TMC school is the only Thai massage school approved such curriculum. TMC offers the course with the highest standard in teaching training. 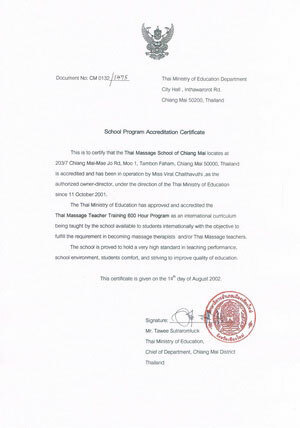 The Chiang Mai Chief of Education Department had issued a certified letter to ensure the authorization of the curriculum and the high standard performance of the school for both curriculums. Now, Thai Massage Teacher Training GCT 600 Hour Program from Thai Massage School of Chiang Mai has the opportunity to offer hope, choice and chance to the Thai community students up to 24 persons each year toward becoming Thai massage therapist when they complete their high school at the Youth Women Development Center (YDC), Mae Rim, Chiang Mai. Thai Massage School of Chiang Mai and Thai Massage School of Thailand in cooperation with YDC to integrate Thai massage profession in their vocational syllabus. Thai massage learning at YDC is an on-going program and will enable the teens to complete as required by the Ministry of Education and the Public Health Department for the teens to earn their credits and qualified to work as Thai massage therapists at the Public Health approved providers. This is the pilot program and we both commit for the long term cooperation. The concentration of this GCT Phase II is toward teaching education since there are 2 most important courses to teach—Level 2 and Level 3. TMC teachers work closely to the GCT teachers at all time. The school director and GCT teacher meet several occasions and discuss teaching planning and any related matter. In fact, the whole school put their support for the GCT teachers of 600 hour. That is why we only offer this program in the low season period and only one annually. This curriculum is the highest reward for both the apprentice and the school. We are proud to be able to turn out noble teachers to spread the teaching of the ancient art from our great teachers to the world. GCT teachers (600) represent TMC school to the world and can join with TMC school to offer TMC courses to anyone under affiliation program. 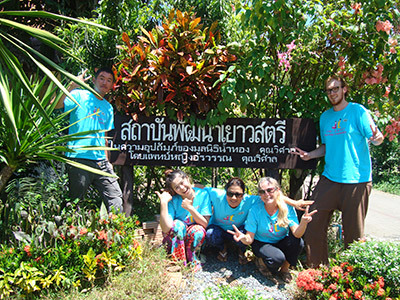 Their students may continue higher learning at TMC school Thailand. 600 hr program may be taken into 2 parts, 150 hrs each part. Written examination will be in the format of analysis teaching techniques to submit. NOTE: GCT students complete PART ONE is entitled to teach Level I and II. 1 day of therapeutic massage service to senior persons at the center. GCT teachers who have completed PART ONE (300 hours) must return to continue PART TWO (300 hours) within 2 years in order to earn the Program Diploma and Teaching Credential according to the program requirement. The GCT teachers may apply to continue PART TWO only within the available schedule set by the school. PART TWO will be week 6 of the GCT 600 Hour Program. NOTE: Returned students from GCT 300 who have not attended Thai Chair Massage, will have the special class offered during the weekend with no extra charge to fulfill teaching credential requirement to teach the class. Classes in hands-on during internship include discussion with teacher for correction, feedback and improvement support during and at the end of each session. Program of classes may change to facilitate the students’ learning and school’s feasibility. 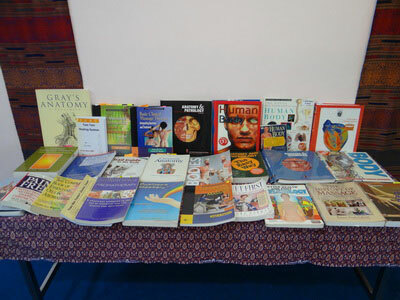 Student is provided with an Anatomy and Physiology book (on loan) for self study. There are more information in books and charts at the library. Interns are trained in each level until being able to perform all positions correctly and be able to retain the memory of all positions. Interns will be trained to teach on each level by demonstrations within the group. Interns will be graded on performance during demonstration examinations within the group. or only Level II. The format will be the same as Level I teaching. Interns will be trained to teach on each level by demonstrations to the community class. Interns will be graded on performance during demonstration and class performance. Program content may change to suite the students’ learning and the school circumstances. Students will be notified as soon as possible. Written examination will be in the format of assigned homework to submit. Supervision technique. Lesson planing and hadling class. (2) Practical Examination: Per each part. Perform combination 2 hours of Thai Massage in all levels to meet the assigned conditions and need. PART ONE performance for Thai Massage Massage Enhancement (Level II) teaching training. PART TWO performance for Therapeutic Thai Massage Massage (Level III) teaching training. Student of GCT program requires class attendance at least 90% in order to complete the program. Student must sign for the absence notice form upon return to class. In the event of advance absence request, student must notify the office as soon as possible for approval. For absence more than 10% of over all course, student must apply for approval to attend make up classes and pay make up fee. This is regardless of whatever the cause of the absence is. The make up class will be subject to the school arrangement. Should student require emergency leave of the country prior to completion of the program, student may request for approval from the school to arrange for return schedule to join future GCT group within two years. The school will assign student to appropriate week of the future group to complete the program. Student may have to take extra week(s) to review lesson(s) In order to be able to follow the new class preformanace at no extra charge. with a refund: Student wishes to return to complete the program, with approval from the schoool, must take the entire part and pay the full fee for that part. Failure to meet any passing scores will result to incompletion of the GCT 600 Hour program on each Part if student apply for each Part only. Student may take make up class (except teaching training) with approval, to achieve passing score. Make up policy and fee applies. NOTE: 600 hr program can be divided in 2 parts, part I is 5 weeks and part II is 5 weeks. Each part require 90% attendance. NC =No Credit for nonattendance. Grade point average score will have total combination of 100 % from all categories from GCT 300 Hour Program Phase I. Should student fail to complete the GCT 600 Hour Program Phase II, student will not earn diploma and teaching credential pertaining to Phase II. However, student is still honored from the completion of GCT 300 Hour Program. NOTE: In the event student completed GCT 600 Hour Program PART ONE but fail during the study of PART TWO, student is still honored from the completetion of GCT 300 Hour Program and with the authorization from the certificate of PART ONE completetion for 2 years after the completetion of PART ONE. Student should return to complete PART TWO and earn honor of the GCT 600 Hour Program Diploma and Teaching Credential with in the time line. Should there is special circumstances due to time, student may write to the school and request for extension which subject to approval of the school director. Teaching credential authorize the graduates to teach TMC school curriculum of Foundation of Thai Massage (Level I), Thai Massage Enhancement (Level II), Therapeutic Thai Massage (Level III), Thai Foot Massage, Thai Table Massage, Thai Chair Massage,The Making of Herbal Ball and Yogi Stretching Exercise. The credential will be granted to the graduate teacher in addition to the diploma of GCT 600 Hour Program. In the event that the student is unable to attend the teaching training internship on any level, but fulfill all other graduation requirement, student may graduate with the diploma of the Professional Thai Massage 600 Hour Program, without the teaching credential on both Level 2 and Level 3. Please note: There will be no make up time for teaching training performance, but student may return to complete the training with the future class when available with approval from the school and pay make up fee. Diploma and teaching credential will be granted to the student completed the program on the graduation day. Transcript will be prepared and completed within 2 weeks after graduation. The school will scan and send PDF file to each student for record. However, the PDF is not official. The official transcript will be mailed by registered air mail. Mailing fee is 300 Baht. If the student does not pay for mailing, the transcript will be kept on file at the school. If student will request transcript in the future, mailing fee can be at higher rate. Student can pick up transcript at the school with no mailing fee. CD Photos is prepared throughout the program for student's memory. The CD will be given to student at the graduation time with the diploma. There will be no graduation photos included in the CD. Student should bring own camera that day or ask a friend to take the photos. The school will not email graduation photos to anyone. 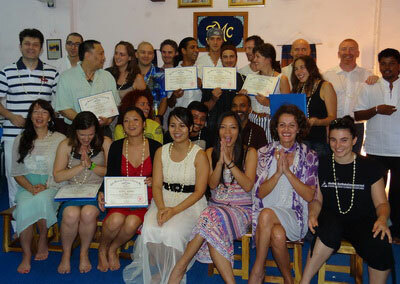 GCT program is the program for students to become professional practitioner and teacher in Thai massage. 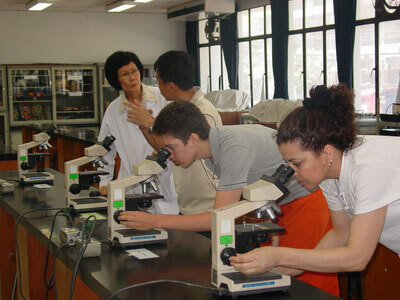 TMC is an accredited school and GCT Program is officially approved curriculum by the Thai Ministry of Education. Other countries have their own law and regulation according to school accreditation and licensing to a person to become a massage therapist and/or to teach massage in a particular country. Therefore, the student must inquire about the acceptance and licensing to practice massage or to teach from their own local government agency. This is the general understanding applied to all type of profession. Please be aware and seek correct information before embark on the massage professional learning. In addition to NCBTMB, AAMT, NPHC etc., TMC is the Continuing Education Provider, this accreditation is applied to the GCT graduates only, and is not extended to students who take course with their students. The graduates may apply with such organization to become providers themselves. Weekly schedule and class plan may change to suite the students learning and the school circumstances, students will be notified as soon as information is available. The GCT Phase II program is subject to very flexible schedule for best situation of both sides. Please be understanding. We will try our best for student's learning benefit. Please keep in mind that each one of us is unique and hold different background. Some students may be learning at faster or slower pace than the other. The teachers will encourage each student to follow the program guideline at similar pace with the class and may provide appropriated support to facilitate learning within the program guideline and schedule to help the student achieve the objective of the program. Please observe Thai culture to be courteous and respectful to teachers as they also show respect to students. and apply to all teachers and learners. Note: Some activity may change subject to the available contact but all the hours will be fulfill. Thai Massage Teacher training GCT 600 Hour Program implement advanced knowledge to the GCT Thai massage teacher with additional learning in physical assessment and physical therapy applied to Thai massage to increase recovery time for chronic illness patients such as stroke or partial paralysis patients. Lecture and workshop by Chiang Mai University professor for Thai Massage Teacher training GCT 600 Hour Program with subject of "Integrated Manual Therapy for Thai massage: Assessments and Treatments including Stroke Patient"
Government Certified Teacher 600 hour program students expand their knowledge in Thai massage to therapeutic healing for people of common conditions. They receive more training in massage practice and perform community services with more complicated conditions seniors at the senior home and to disabled children. 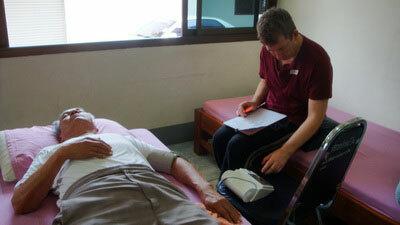 The knowledge and experience they add on will enhance their profession both as therapists and Thai massage teachers. Meeting with the director of the Senior Center lead the group by TMC school director. 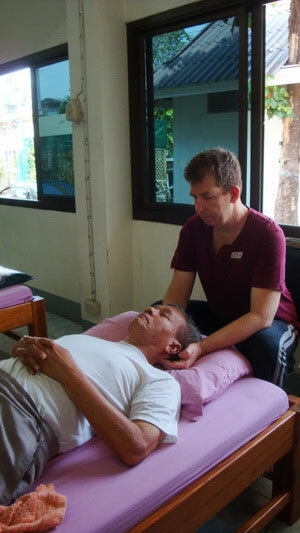 Teacher training intern offered Thai therapeutic massage to the senior with total commitment. The end of the day, they parted with love and heartfelt appreciation on both sides. 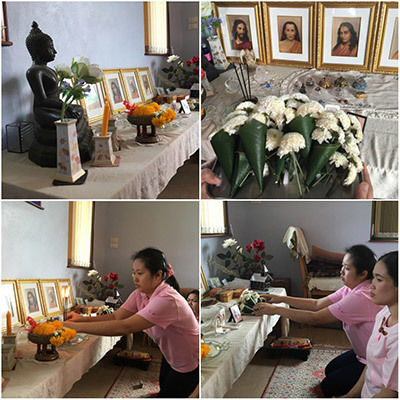 TMC Government Certified Teachers (GCT) present Thai massage training in affiliation with TMC school, Thailand following TMC curriculum around the world. 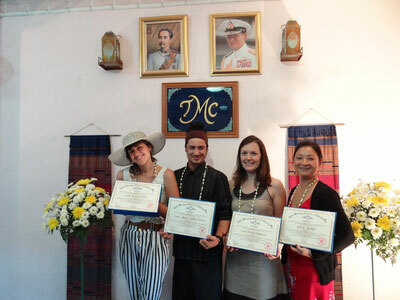 Students graduated from GCT teachers teaching will be able to pursue higher learning at TMC school, Thailand. 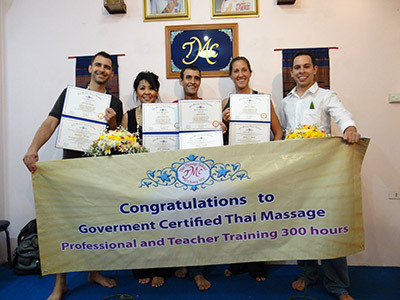 There are over 600 TMC—GCT teachers who are Government Certified Teacher of Thai massage and hold certificates (approved by Thai Ministry of Education). 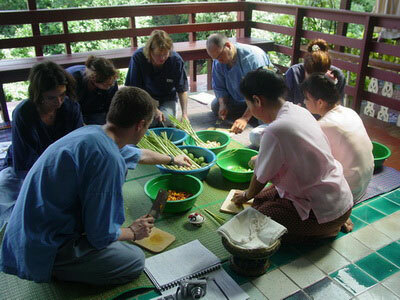 The school advises anyone who is interested in taking Thai massage course from a qualified teacher. They can be the teachers near where you are. This will save your traveling time and expenses. The school can assure you that all GCT teachers who hold the TMC teaching credential are fully qualified to teach with high standard and quality equal to learning at TMC Mother school. We are able to assure you from the result of the education when the affiliated students come to take higher level at TMC school and are able to continue the course without any difficulty the same like students at TMC! We do have numbers of affiliated students at TMC and some completed 3 Levels from the GCT teachers and are able to continue either Level 4-5 or some pursue GCT 300 – taking 7 more weeks learning. 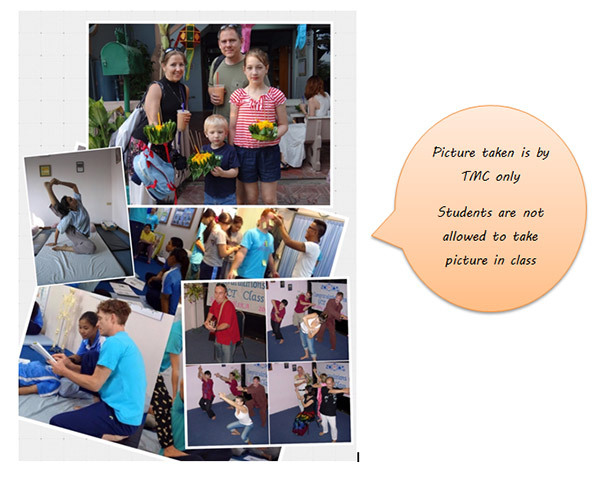 All students are able to perform exactly like students learning prior levels at TMC school. This is the proof that all GCT teachers teach the same as TMC and with high quality. You may contact TMC affiliated teacher in your area directly or write to TMC school for contact information. Demonstration at the community exhibition and training course offer. Offered Thai massage course to students by invitation at Halsa Massage School, California, U.S.A.
SingTrain Academy & Consulting Pte Ltd.
Bodhi Thai Massage, a division of Bodhi Health and Wellness Ltd. Address: Camino el Alba 9569, Metro Los Domínicos, Las Condes. Emmanouil Dimoudis Kissimmee, Florida, U.S.A.
(Mimi Wiggins) Swanage, Dorset, U.K.
Students of teacher training at TMC school when complete the program, they earn "Teaching Credential" as Government Certified Teacher (GCT) from TMC school. The Government Certified Teachers (GCT teachers) are qualified and entitle to teach TMC syllabus throughout the world subject to the legal requirement in their country jurisdiction. Students complete approved courses from the GCT teachers are qualified to continue higher learning at the mother school TMC Thailand without having to take the same course again. The GCT teacher will need to apply with the affiliation program for their students to entitle this privilege.